Growing up I remember Wednesday was the night to go to my friend April's house. Why Wednesday? Because at her house, Wednesday was always spaghetti night. They always had a great spread of garlic bread, salad and really good spaghetti. In fact, every time I make spaghetti, memories of spaghetti night at April's house come to mind. Although it's not Wednesday, this post is dedicated to April for the times I was lucky enough to enjoy spaghetti night with her family. I recently made this Baked Spaghetti & Meatballs that definitely hit the spot and makes for a nice one dish dinner! Spaghetti and meatballs can certainly be a production to make in the kitchen. You've got the sauce that can take up to a few hours to make for the flavors to develop. The pasta that needs to be cooked to that perfect al dente. And we can't forget the meatballs that are hand rolled and prepared while everything is going on. After all is said and done, the kitchen may look like a disaster and never mind the mountain of things that need to be washed! Well, this version of spaghetti and meatballs is much more easier and will leave your kitchen in decent shape afterward. The sauce is cooked in a crockpot giving you some time for yourself. For an added treat, I included mini meatballs in this dish that wasn't part of the original recipe. The mini meatballs are formed and simmered with the sauce in the crockpot. The main effort in the dish is just assembling everything in a casserole dish. Layers of the spaghetti, sauce and cheese are put together and baked to perfection. In a large bowl, combine ground beef, bread crumbs, parsley, Parmesan, 1/4 teaspoon black pepper, garlic powder and beaten egg. Mix well and form into 36-48 mini meatballs; set aside. 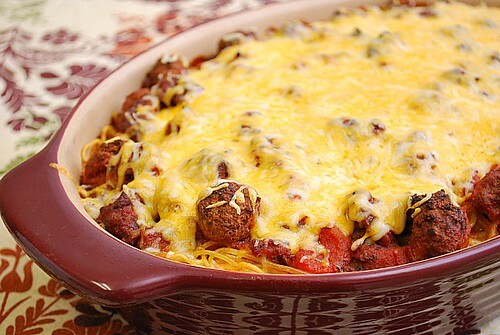 Crumble the ground beef in a large skillet. Cook over medium-high heat until fully cooked, with no pink color remaining. Drain the fat from the meat, and then transfer the ground beef to a crockpot. Add the mini meatballs, tomatoes, tomato sauce, water, onions, peppers, garlic, parsley, seasoning mixtures, sugar, and bay leaves. Cover and cook on low for 4 hours. Cook the pasta according to the package directions. Cover the bottom of a 13 by 9 by 2-inch pan with sauce. Add a layer of pasta and then a little less than 1/2 of each cheese; repeat the layers, ending with the sauce. Bake in the oven for 30 minutes. Top the casserole with the remaining cheese, return it to the oven, and continue to cook until the cheese is melted and bubbly, about 5 more minutes. Cut into squares before serving. Mm there's just something about baked pasta that I love. This looks delicious. I made this recipe awhile ago and enjoyed it. I don't usually think of Paula Deen for Italian so I was very surprised when it came out good! Love this! Such a classic!! I've never heard of baked spaghetti and meatballs! But I'd have to agree with Julie, I adore baked pasta dishes. will be a great author.I will be sure to bookmark your blog and will come back later in life.